No the Spartan does not have selfrighting.Yes you can run one 6s, just connect the type of plug +/- to the esc that your batteries run on but make sure you add the second battery to keep it balanced. It will add a lot more weight which will effect speed and handling but is worth the try. I'm installing two 2s batteries on each side of my M41 with a water cooling bladder between each set to help with heat from the batteries. I'm in the same position where I have 8 5000mah 2s batteries and want a longer run time without purchasing a higher mah battery and it is a lot heavier but I haven't had time to run it yet. Ty for the info. That kind of stinks , guess I may have to keep my other boat now as a rescue boat. Also I would not want to run another battery not connected so I may as well get some lower mah 6s and 4s to run together at once. What mah size do people usually run in these ? With the 5000 mah 2-2s's (4s total) I get about 8-10 min. at mostly full speed and another 8 or so min. at 50% power. So with stock setup my max is (34mph) on 2-2s batt's or (50+) on 2-3s batt's. I make sure I don't use batteries with under a 50c rating because of puffing issues in the past (not saying you can't use a lower c rating I just choose not to). I set my cutoff voltage at 14.4 (4s) with the telemetry so I don't end up over discharging and have lots to get back to shore. So I would say nothing under 5000 mah min. 50c. Speeder what in is going on in this pic ? Do you run your batteries outside of the boat like that ? Is that a charger up front? I don't quite get it . 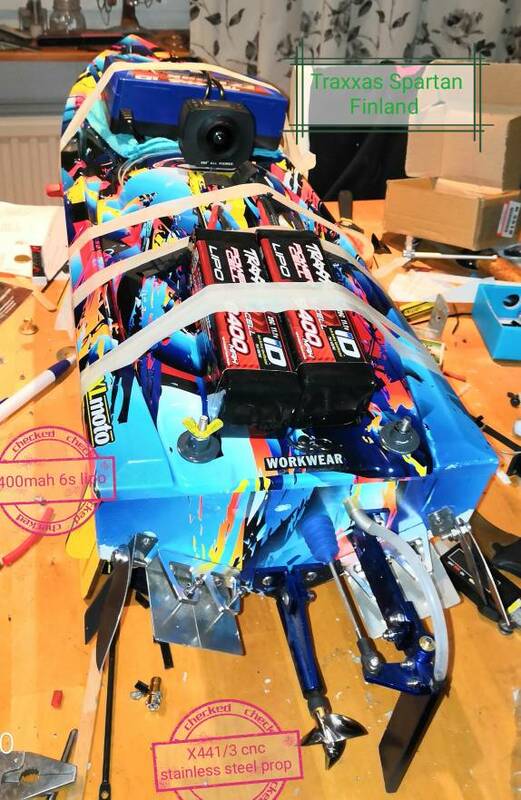 What I am most likely going to do is run 2 6s lipos inside and wire the esc to handle it since most of my Rc land vehicles run on 6s I can use them for both. Last edited by Double G; 11-05-2018 at 02:36 PM. Speeder what in G-d's name is going on in this pic ? Do you run your batteries outside of the boat like that ? Is that a charger up front? I don't quite get it . What I am most likely going to do is run 2 6s lipos inside and wire the esc to handle it since most of my Rc land vehicles run on 6s I can use them for both. (LOL) I think that's the way he transports it. I like your canopy fasteners. That's a terrific idea. I did mine this way. 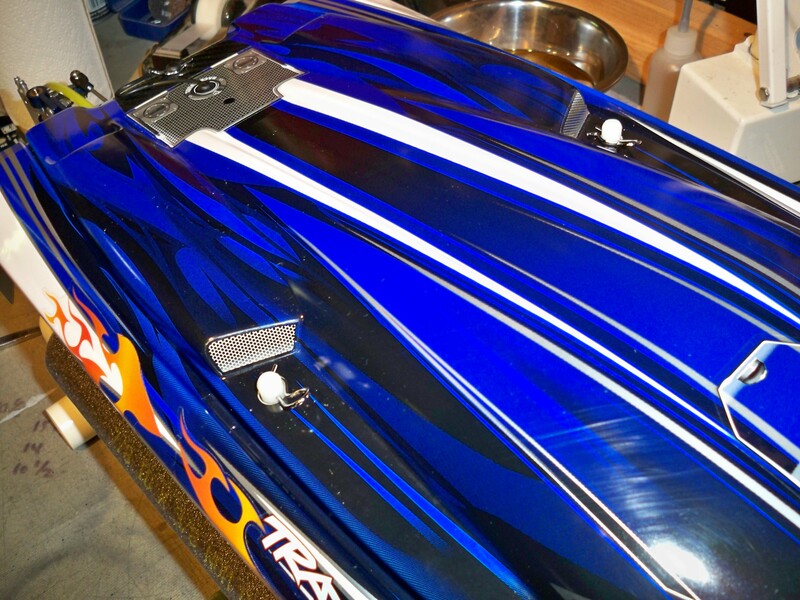 I might have to give your way a try when I replace my hull with a custom painted one.